The Headline above about says it all for this famous #Route66 Cafe in California. Flame from the #BluecutFire destroyed it earlier tonight. I was familiar with the Summit Inn from various books on the Mother Road but here are its details. 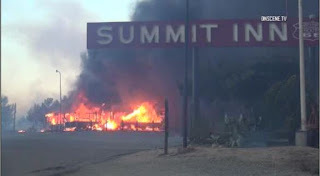 "The original Summit Inn was in operation in 1928 and takes its name from its original location at the summit of the Cajon Pass between the westbound and eastbound lanes of US 66. The present location in unincorporated Oak Hills, California has been in operation since 1952 when 66 was rerouted along a somewhat lower elevation. 1953-era postcards depict a Horseless Carriage Rally at the Summit Inn which included vintage Ford Model T's. Cecil “C.A.” Stevens bought the station and restaurant from original builder Burt Riley in 1966; he'd wanted just the Texaco filling station on the site but agreed to buy both if Hilda Fish, a German woman who ran the restaurant, were willing to stay to run the place. Hilda Fish retired in 2002 and is now deceased. Route 66 in the area was obliterated by Interstate 15 in California by 1970." For all the ghosts and memories that went up in flames tonight, Rest In Peace. I'm sure this was one of those 'if these walls could talk' type places. So Mr. Stevens, as you shed a tear from Heaven over the loss of your great place, So do I and others. Thank you for your contribution to American History.